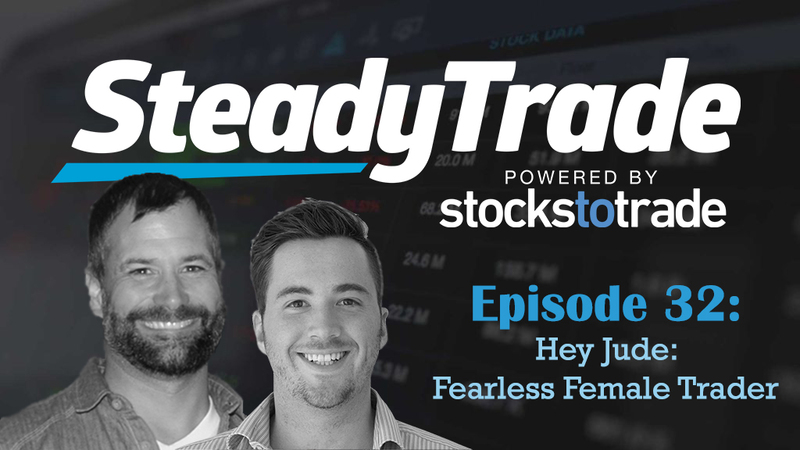 This week hosts Tim Bohen and Stephen Johnson interview Jude, who in addition to being a talented musician is also a budding trader. Still identifying as a newbie, this interview sheds a lot of light on common obstacles for new traders and offers universally helpful suggestions for how to move forward in your career with confidence. Jude is a registered massage therapist. This type of work can be physically demanding, and she is well aware that she won’t be able to do it for the rest of her life. In conferring with a friend who lives a gypsy lifestyle funded by day trading, she became fascinated by the prospect of learning how to trade as a potential future income stream for herself. Jude jumped into trading without really having any knowledge, and quickly learned that she had a lot to learn if she was ever going to find success on this career path. So, she took a step back. Searching for mentors led her first to Timothy Sykes, who she appreciated for his brutal honesty; this was the beginning of her trading journey. After learning the ropes of trading from Sykes, Jude realized she was still fearful about making the jump from education to actually trading. She joined Stocks To Trade Pro as a means of “hand holding” and to help her bridge the gap between attaining knowledge about trading and actually putting it to work. She is a fearless female trader! She’s also been a loyal podcast listener, listening to episodes such as Episode 24, which profiles the incredible trading journey of Michael, a Tim Sykes student phenom. At this point, Jude is at the precipice of trading in earnest but feels like she still needs a little nudge. What will it take to help her spread her wings? Catalysts: How do they work, exactly? Tim and Stephen offer some insight for how to decipher the meaning of various catalysts, and advice for how to “read the fine print” and how to determine if a catalyst will really have an effect on the stock you’re trading. Tracking charts: Tim is constantly suggesting that traders track charts “til your eyes bleed”. But this really isn’t productive if you don’t understand the data! To help facilitate more productive study time, Tim and Stephen offer suggestions for how to productively examine charts. Getting consistent: Tim and Stephen offer productive tips on how to develop your own setups, what to look for in patterns, and learning what works for you as a trader. Moreover, Jude has the right idea in her approach to trading. She’s set on the long game, and she’s not rushing in (a common new trader mistake). She doesn’t have the “get rich quick” mentality, and this is likely what is going to keep her ahead in her career. Traders of every level, from brand new to established, will find wisdom in the topics discussed in this episode. Ultimately, these topics will help enable you to take your trading to the next level. Got a question about something in this episode, or any other episode? Or, a question about trading in general? Let your voice be heard! Visit the “submit your audio” section on our website to offer comments, questions, or suggestions. Your audio might just be featured in an upcoming episode! Great Podcast. Good attitude Jude. 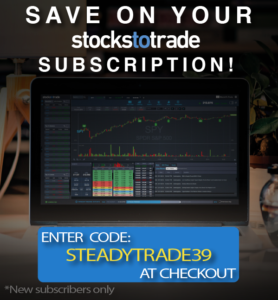 I am a newbie myself and have just joined Stockstotrade Pro. Still in the learning mode, making a few trades, but trading small until I can learn how to get consistent and to be able to grow my account. Thanks Cal!!! Keep up the hard work! She was adorable!!! What a lovely and fun addition to your team! Nice to see a very different mindset from the usual hotshot go-getters! Thanks! Great comments Diane!!! I agree its great to bring in traders in all phases of the journey! Great job learning as much as you can before getting started Beth! Great podcast – apart from the tank top – poor Steven. It’s so important to keep things real and to get help along the way as you grown and explore the market. Tim says its a battlefield and it is. But the more you learn and the more you commit to learning, the better prepared you will be. Love the comments! Thanks for listening Sebrina! I love this podcast. My recently added to do list was exactly what you guys talked about today and with a long weekend ahead of us its the perfect time to categorize my charts 🙂 plus so much more research I have to catch up on . Great variety of speakers yet again!! Guys, if you make those shirts, I want one. Just don’t make ’em tank tops will you? Refreshing episode. Nice to hear from Jude beginning experience, I am 8 month into Tim Sykes Challenge and I have learned a lot. I never thought would be possible for me to learn and trade but I am changing that. Thank you guys for all you do and people you pick for the interviews. Great Stuff. Thank you!